Fr. 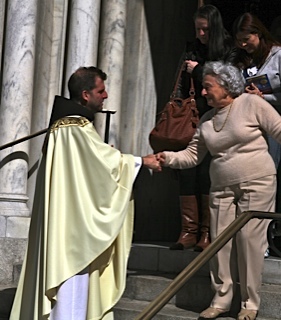 Sean greets Sacred Heart parishioners after Mass. Sometimes I feel ill equipped to adequately describe a typical day in my life as a priest ministering in a busy urban parish like Sacred Heart Church in Tampa, Fla. Yes, I say Mass, not just on Sunday, but usually every day. The daily communicants who come through the doors of our 150 year-old church are from all walks of life – men and women who work downtown, housewives, tourists, police officers, students, and homeless people looking for a place to rest their weary hearts. They all bring their hopes and dreams, worries and concerns and place them on the table of the Lord, seeking to be fed with the presence of God’s goodness, love and hope. At Sacred Heart, the celebration of the Eucharist and the Sacrament of Reconciliation are much appreciated and well attended. I am frequently reminded why they are called visible expressions of God’s invisible grace. It is a great honor and very humbling to be a minister of these special sacraments. The mystery and wonder of God’s grace is always without limit. It is revealed while grieving with family members gathered around the hospital bed of a loved one awaiting sister death or transporting a homeless man to a nearby detox center to help him with his drug addiction. At other times it is listening to a student struggling with the social and academic challenges of high school. The wonder of God’s grace is also revealed while working with couples preparing to marry and helping them to better understand themselves and their future spouses or by participating with a dedicated group of parishioners seeking to find new and better ways to help the growing homeless population who walk our streets. Fr. Sean poses with students of Sacred Heart School. A parish ministry to which I dedicate a portion of my time involves our parish school. I believe our schools can serve as great tools for evangelization for Catholic as well as non- Catholic students when partnered with the church community and dedicated parents. As a middle school religion teacher, I know that if the material I intend to teach is to have any meaning for the students, it has to be presented creatively and be relevant to their world. As a result, my lesson plans often include activities such as sharing in a real Passover meal, painting the story of St. Francis on our classroom windows, performing puppet shows rooted in the gospel parables, or engaging the students in a competitive game of scripture jeopardy. Frequently, I am reminded why children often serve as our greatest teachers, and how God’s grace continues to reveal itself in unexpected and surprising ways. Once, at the beginning of a class, while impatiently telling the students to hurry and get ready for the work we had to review, a quiet voice echoed from the back of the room, “Fr. Sean, ….we forgot to pray.” And I’m the religion teacher? Of course, my life as a priest is filled with many other wonderful experiences, but it only makes sense within the context of my Franciscan vocation. My brother friars with whom I live and work and pray continue to encourage, inspire and challenge me to live the gospel of Jesus Christ in the spirit of our brother Francis. I am forever grateful for the countless ways God’s grace is revealed through them and seek always to remain open to how it may continue through me. Fr. 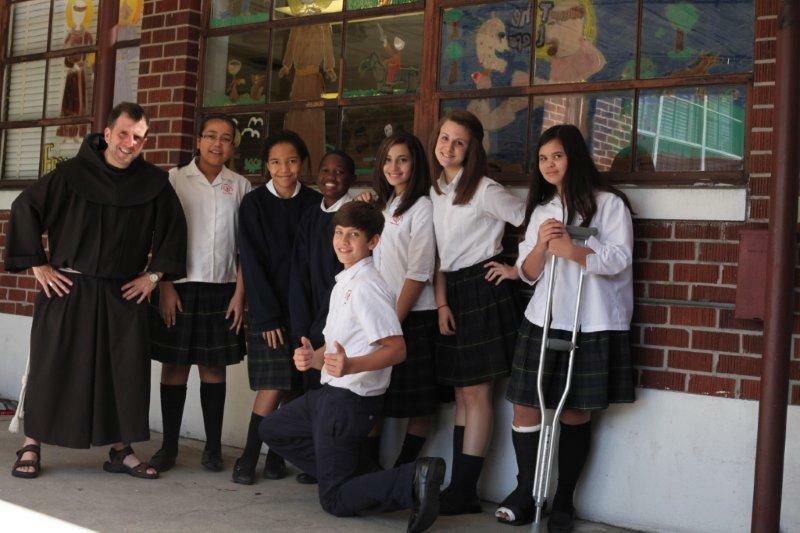 Sean serves at Sacred Heart Church in Tampa, Fla., where he teaches in the parish school.